Stylish and reﬁned, thanks to a Cuvée mainly on sands. The rustic touch of tannins fades, and silkiness overrides... Shows a real Class ! 12 months in one and two vintages barrels. Allier et Tronçais. Then 10 months in foudre. Alcohol level (% vol. ): 14,5% % vol. Decant 2 hours before service. finish. Grenache, Mourvèdre and Syrah. 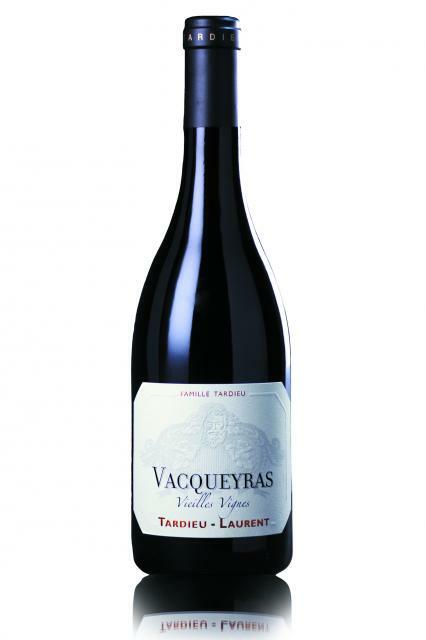 Drink now through 2025"
"A step ahead of the Rasteau, the 2016 Vacqueyras Vieilles Vignes shows genuine local character in its notes of raspberry-like Grenache fruit and garrigue shadings. It's full-bodied, plush and long on the palate, with ample concentration and less overt oak than expected. It's 70% Grenache, with the balance split between Mourvèdre and Syrah. Half of the fruit was vinified whole cluster and aged in concrete, the other half was destemmed and aged in barrel." "Raspberries and plums with darker-fruit nuances. Fine, chalky tannins carry freshness and plenty of flavor. This has attractive, pared-back purity. Drink or hold." "Youthful violet. Ripe cherries and dark berries on the deeply perfumed nose. Shows impressive power and depth on the palate, offering ripe blackberry and candied cherry flavors complicated by hints of candied lavender and licorice. The smooth, youthfully tannic, smoke-tinged finish delivers solid punch and leaves sappy cherry and floral notes behind." "Mid crimson. Spicy, transparent nose. Broad and polished. Tastes somehow purple and sumptuous. Not short of alcohol but there is flavour here in spades too." "Lastly, the 2016 Vacqueyras Vieilles Vignes is a charmer that offers loads of fruit and texture, in a more forward, gulpable, balanced style. Plums, crushed rocks, violets, and pepper all emerge from the glass and it has medium to full-bodied richness, fine tannin and notable purity. It will drink nicely right out of the gate." "black-tinted, dark robe. There’s a roll of fat blackberry fruit on the nose, which has a savoury depth, darkness, a little mystery, plenty of core. The palate runs with a free handout of sleek matter, sparky black fruit along its trail, blueberry prominent. The nish brings in some garrigue, herbs in uences. This has character, and will gradually come together, the nish still powdered and a little rocky. 14.5°. From late 2019. 2030-32 Feb 2018"
"Le Vacqueyras est bien plus solaire, sans pour autant perdre en cohérence."